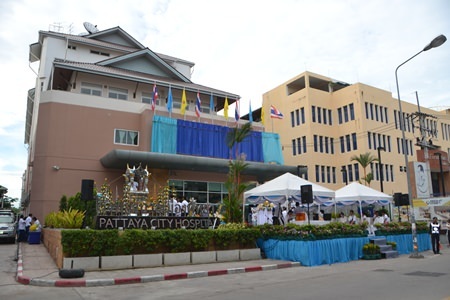 City officials celebrated the official upgrade of Pattaya Hospital from a primary-care center to a full-fledged secondary-care hospital with religious ceremonies June 28. Mayor Itthiphol Kunplome joined hospital director Dr. Kitsada Manoonwong and city council members, administrators and facility staffers for the early morning Buddhist and Brahmin ceremonies. The Brahma statue was placed on the throne with four posts via a sacred holy thread. Monks chanted Chayanto and poured holy water to officially mark the “opening” of the upgraded hospital. 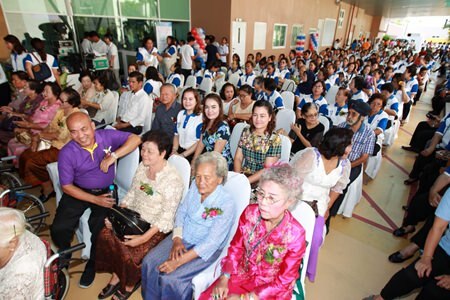 Pattaya City Hospital on Soi Buakaow, next to the Public Health Department, celebrated being upgraded to a secondary-care center. Pattaya Hospital opened its doors in May 2013 for limited service with just 30 beds. Another 60 beds came online in November that year and “full” service was offered with 86 beds in January 2014. With its upgrade to secondary-care hospital, Pattaya hopes to bring capacity up to 110 beds. 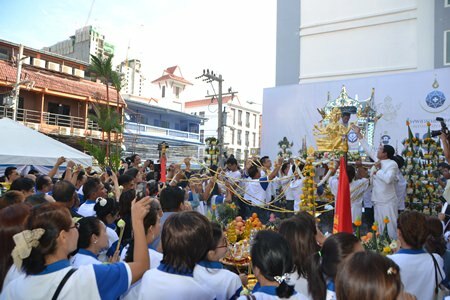 Besides religious ceremonies, the event also offered speeches and lectures from doctors and movie star Ken “PuPhum” Pongpanu. Dr. Kitti Srithongkul talked about Pattaya Hospital’s orthopedics department and its work on treating rheumatism. Those attending also were offered a 10-course physical exam. 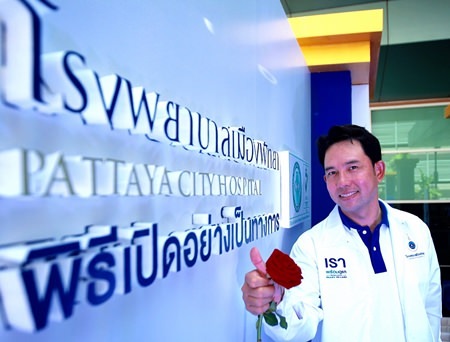 Pattaya Hospital is a key part of the city’s “20,000 beds” initiative, which includes city doctors regularly visiting and treating patients in their homes. As a secondary-care facility, Pattaya Hospital will go beyond primary treatment to focus on support, prevention, and rehabilitation of illnesses both physical and mental. However, the hospital is still short of staff and lacks specialists in many areas. Therefore, Pattaya will hire a private company to operate the hospital and take responsibility for ethics and regulations. When fully staffed, the hospital hopes to serve more than 20,000 patients per month. Previous articleIs working under pressure important?